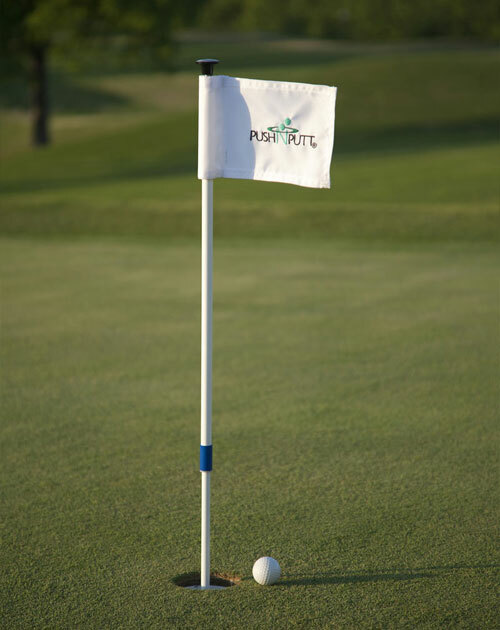 PushNPutt offers the world’s only interactive putting green flagsticks. Our patented design has revolutionized the way that golfers enjoy the game. No matter your age or ability, our flagsticks allow players to retrieve their golf balls from the hole without straining their backs or knees. It’s due to our unique design that automatically lifts and spreads out golf balls evenly back onto the putting green. Whether you’re a novice or a pro, everyone can benefit from owning our putting green flagsticks. Jerry Mallonee is the innovative mind behind the PushNPutt flagstick. After noticing how his father-in-law struggled to retrieve his ball from the hole, Jerry went over to help. He noticed that the year 1958 was stamped onto the bottom of the cup. This inspired him to create the first innovative product in practice putting in over 50 years. The PushNPutt putting green flagsticks cut down on the time it takes to retrieve your golf balls, effectively giving you more putts per session. In addition to owning the latest in putting technology, our flagsticks are also functional. They keep your practice area looking good and minimize your maintenance costs. When golfers are unable or unwilling to bend over and retrieve their balls, they usually will use their putter to dig out their golf ball. This tears up the turf in addition to damaging the cup. But because our flagstick retrieves the balls for you, there’s no need to dig around for your ball. Keep your putting green pristine with PushNPutt! Although PushNPutt is our original model, we also offer two other types of interactive flagsticks. Our LiftNPutt offers the same revolutionary ability to evenly disperse golf balls onto the putting green with minimal effort. Instead of pushing on the flagstick, simply lift up! Our PutterUp model is a smaller version of our LiftNPutt flagstick. These putting green flagsticks are perfect for indoor courses or putting greens. The PutterUp flagstick has a handle affixed to the top of the flag, which can perfectly accommodate a putter. Simply hook your golf club onto the handle, lift up, and your golf balls are easily raised out of the cup. All of our interactive putting green flagsticks feature the highest quality materials backed by a one-year warranty. From outdoor plastics to stainless steel, our flagsticks can withstand all conditions. You even have the option to further customize your products by choosing different colors or flag designs. And all of our models are produced in our North Carolina facility. Whenever you order from PushNPutt, you can rest assured that you’re buying the best! Whenever you’re ready to own your own PushNPutt, shop the selection of patented putting green flagsticks in our online store. You can also order a custom embroidered flag and select from a variety of colors! Be sure to contact us with any questions about our innovative product – we’re happy to help!